Dubé Juggling is proud to announce our newest product line, the Stage Lite Ball. The Stage Lite combines our traditional low-bounce hard shell Stage Ball with our ever-popular LED Lighted Ball. The result is an excellent and extremely visible juggling ball for on-stage performance. Available in both 3.5 inches and 4 inches, the Stage Lite comes in green, blue, red and white, as well as the three-color strobe and the color change, which cycles slowly between five colors. 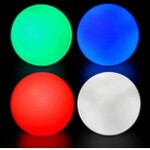 Each Stage Lite Ball is powered by three button cell batteries (included) which have an average life of 10-20 hours. So weather you’re looking to expand your stage repertoire , or simply looking for something fun to juggle in the dark, the Stage Lite is an excellent choice for performer and hobbyist alike!